Continuity mistake: When he has the accident after hitting the dog, there is a big very noticeable dent in his truck. After he leaves the camp place it is gone and never seen again. Factual error: Dr. Dolittle is driving through San Francisco with a cup of Dunkin' Donuts coffee - there are no Dunkin' Donuts in San Francisco. 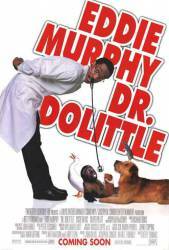 Trivia: Eddie Murphy had a big problem while working on this movie: He is very squeamish about most animals. It is even so serious that he flatly refused to do a scene involving an alligator. Hence, most shots with animals were done via blue-screen technique. Trivia: The scene where Dr Dolittle awakes to find the guinea pig in the bed with him looks like an homage to the horse's head scene in The Godfather. The way he screams, and the way the camera cuts to an external shot, is an exact copy. Lucky: A little girl once called me "Please mommy, not him." Dr. John Dolittle: Oh, no, I'm - we're - we're fine. I'm just stretching my legs a little here. Rodney: Ask her if she's got any lettuce. Dr. John Dolittle: Shut your mouth. Shut your furry little mouth right now. Question: Why did Geno break Mark's nose at the end during the party? Answer: Geno deliberately broke Mark's nose during the party after Mark made a snide remark. After the party, when Mark suggested a way to have John committed and still get their money, Geno had enough of Mark's ignorance and punched him in the nose again to add further insult to injury. Question: What kind of dog is Lucky supposed to be, a mix breed or collie mix? Answer: Lucky is a mongrel mix. A mix of 2 breeds. A quick search suggests a possible terrier and lab mix.